The idea was first floated by academics when 20 professors & scientists signed a letter asking Obama to prosecute climate change (or what used to be called “global warming”) skeptics. They signed the letter despite the fact that there isn’t even agreement within the scientific community that (a) the Earth’s climate indeed is warming; and (b) it is human actions that cause that alleged warming. Now 17 state governments are doing what the federal government is considering. On March 29, 2016, flanked by climate-change profiteer and hypocrite Al Gore — he who owns several luxury, energy-consum mansions and attended the Sept 2014 People’s Climate March in New York in a large carbon-burning Chevrolet Suburban SUV — 17 Democratic attorney generals (AGs) announced in a press conference that they will be targeting, with legal action and huge fines, any company that challenges or denies climate change. Hans von Spakovsky reports for The Daily Signal that the coalition of 17 “AGs United for Clean Power” treated climate change as an absolute, unassailable fact, instead of what it is— a controversial and unproven scientific hypothesis. 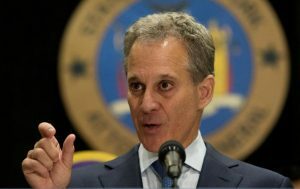 Speaking at the press conference on March 29, New York AG Eric Schneiderman declared, “The bottom line is simple: Climate change is real.” He threatened that the AGs will pursue “to the fullest extent of the law” companies that commit fraud by “lying” about the dangers of climate change. AGs of the District of Columbia and the Virgin Islands. 16 of the 17 AGs are Democrats, while the AG for the Virgin Islands, Claude Walker, is an independent. Schneiderman and Kamala Harris, representing New York and California respectively, have already launched investigations into ExxonMobil for allegedly funding research that questions climate change. Exxon emphatically denounced the accusations as false, pointing out that the investigation that “uncovered” this research was funded by advocacy foundations that publicly support climate change activism. Standing next to Schneiderman throughout the press conference was the new inquisition’s Tomas de Torquemada — Clinton’s former VP Al Gore, who narrated a climate change propaganda film in 2006 entitled “An Inconvenient Truth” and deftly peddled the global-warming propaganda to amass a multi-million-dollar fortune. Gore praised what the coalition is doing as “exceptionally important,” never mind that what the AGs are doing is nothing less than prosecuting a thought crime. When pressed on the effect that such investigations and prosecutions will have on free speech, Schneiderman said climate change dissenters are committing “fraud” and are not protected by the First Amendment.